I’ve always wondered what it would be like to go on a big game hunting expedition. 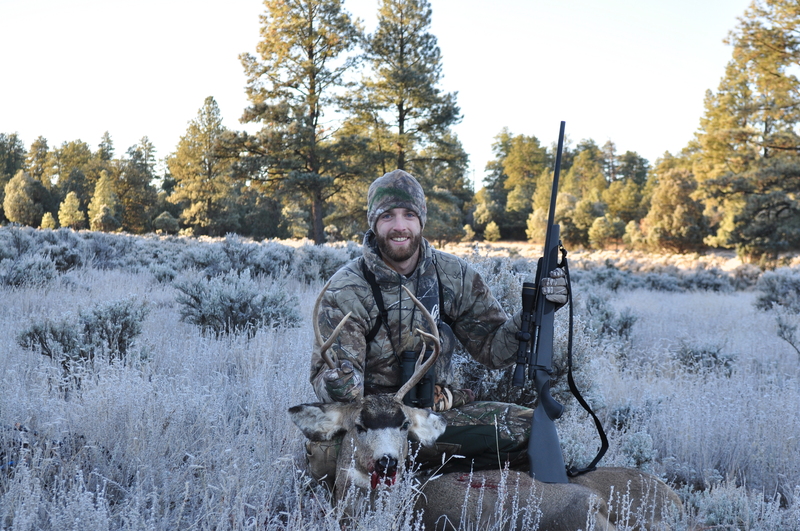 Well, at the age of 28 I finally decided to put in for elk, deer and javelina. I was lucky enough to draw for mule deer and javelina. In New Mexico you get to choose three different hunts and, when chosen in the lottery system, the computers go through your selections in descending order to see if there are any tags left. If there are some tags left, you are the lucky owner of a hunt in the land of enchantment! When going through all of the possible hunting options, which was a new thing to me, I decided to put in for some ambitious hunts. The hunts to the north seemed to be low draw rate and I am not very familiar with the southern part of the state. If I wanted to go North I was going to have to do my due diligence, so I wrote some code to go through all of the hunts and spit out the best options. I admit, I am a nerd, but I use it to my advantage. Even though I went through all of this trouble with code and whatnot, I ended up putting in for unit 5B which had a draw rate of 0.84% in 2013 and 0.65% in 2014. In other words, I got EXTREMELY lucky to draw a tag. The reason I choose 5B as my first choice was simple, why the hell not and I’ve seen a few deer around there while driving to go fishing. I was happy to get out and explore a new area too. My first mission was to explore the unit and scout for deer. I procrastinated a little and chose to go fishing instead of scouting one weekend, whoops! 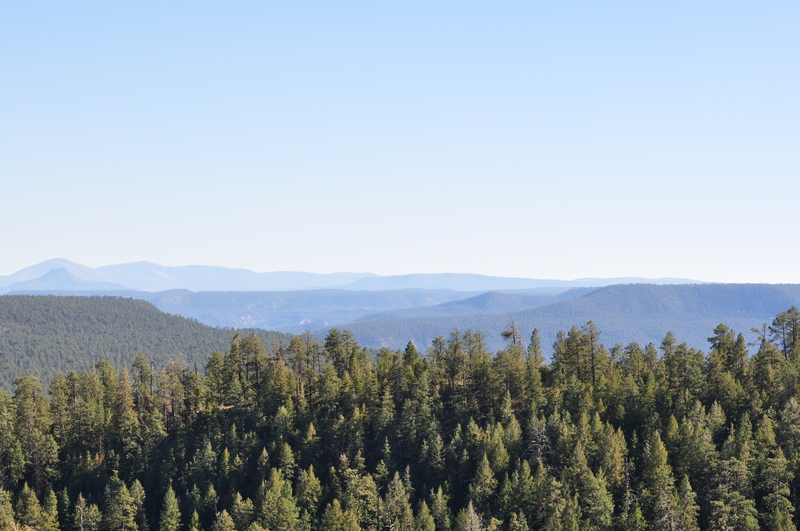 I did manage to get out and scout the area the weekend before my hunt. 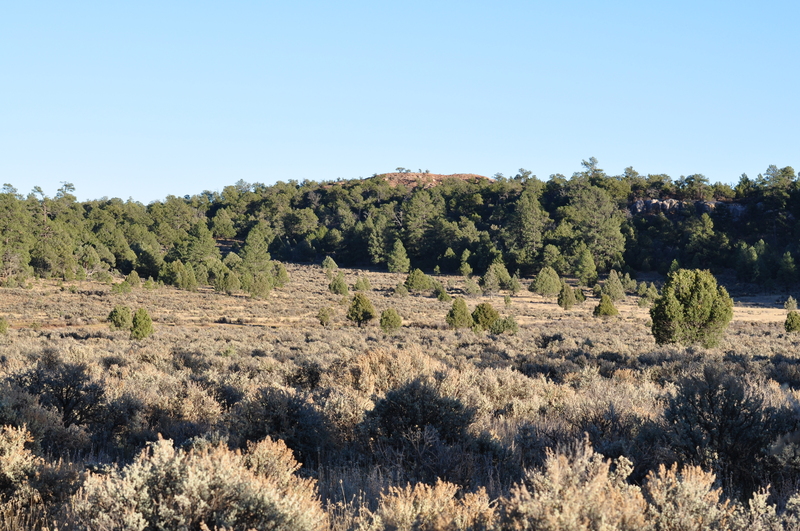 The landscape is very suitable with some sagebrush meadows sitting between steep ridges with juniper and ponderosa pines. 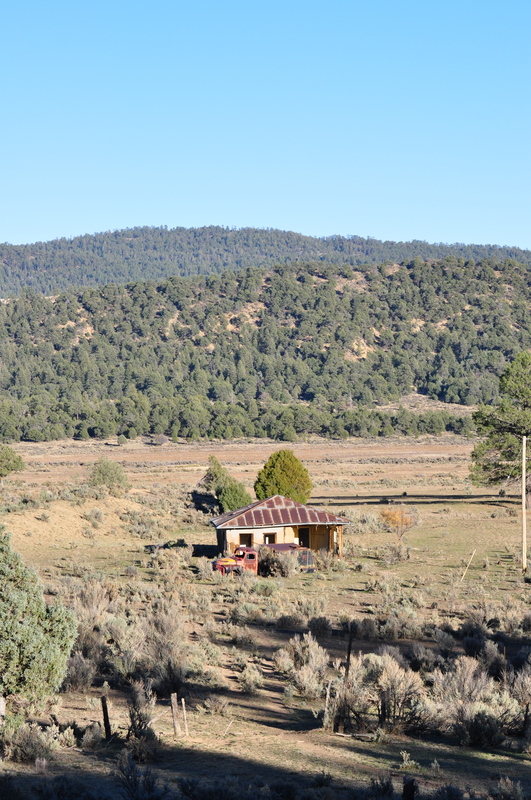 The perfect area for deer and elk. On my scouting adventure I left home around 4am and was in the unit by sunrise. I had spotted a few tanks on google maps that I wanted to check out so I made my way to them. Sure enough, as I parked the car and quietly made my way to the tank I noticed a strange object staring at me through the twilight, a cow elk. 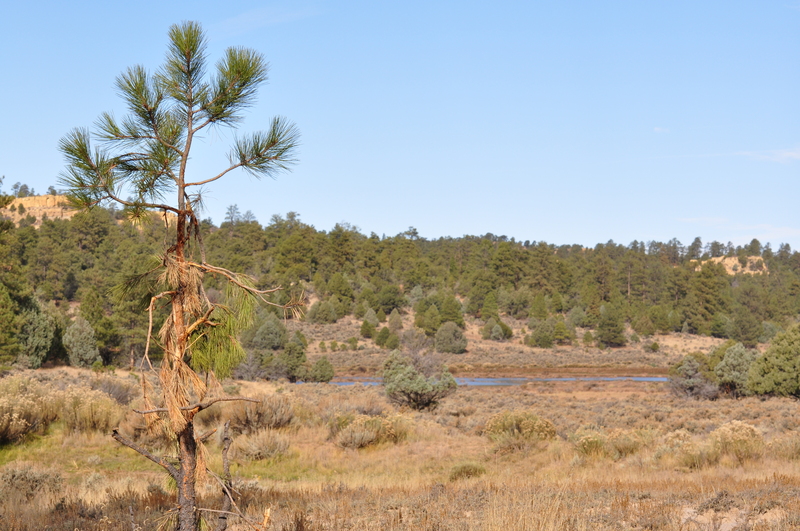 I sat down and kept an eye in the area and saw a few more cows and one small bull elk. A good start to scouting the area. So those were the only animals I saw the entire day. Nonetheless, It was a good way to start my first scouting experience. At least I was able to get some hiking and driving in. My hunt started on a Sunday and ran through Wednesday. I headed up on the Thursday before the hunt to secure a camping spot and get some last minute scouting in. My two buddies, Justin and Brian, were coming up on Friday and Saturday. I had gotten some beta on the area from my high school basketball coach earlier in the week and wanted to check it out in the evening and morning. The area he sent me had multiple tanks with tons of elk and deer sign. As I laid in my behemoth sleeping bag that evening the excitement of the hunt was starting to hit me. The next morning I headed to the same area to do some glassing and hiking around. I snuck, or sneaked if you are a grammar snob, through the dark to some large boulders that sat high above the surrounding area and provided a good prospective of the tanks below. It dawned on me as I looked through the binoculars that I really had no idea what I was doing. I can say, though, I was happy to be out there learning as I go. I think this is some of the appeal of this adventure for me, taking a few steps into the unknown. As the dark turned into twilight I noticed two butts walking through the sagebrush from the tank to the forested area above. As soon as I spotted them they were gone into the green juniper and ponderosa with just enough time to ID them as two small does. Finally, I had spotted a deer. After some more glassing and the sun finally peaking over the ridge I decided I was bored and needed to move around. I did some hiking while looking for animals and sign. 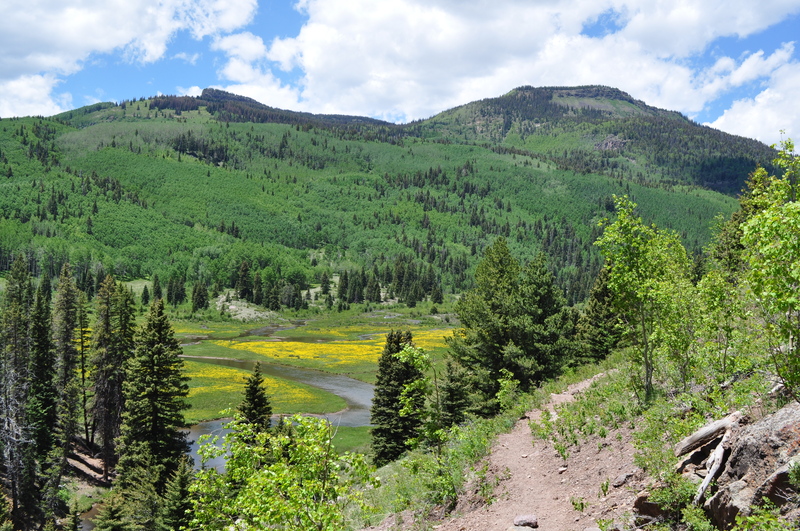 I wasn’t able to spot any animals, but I did see a lot of sign and found some spots to check out for the next few days in my quest for mule deer. I got back to the car and headed to camp to meet up with Justin. 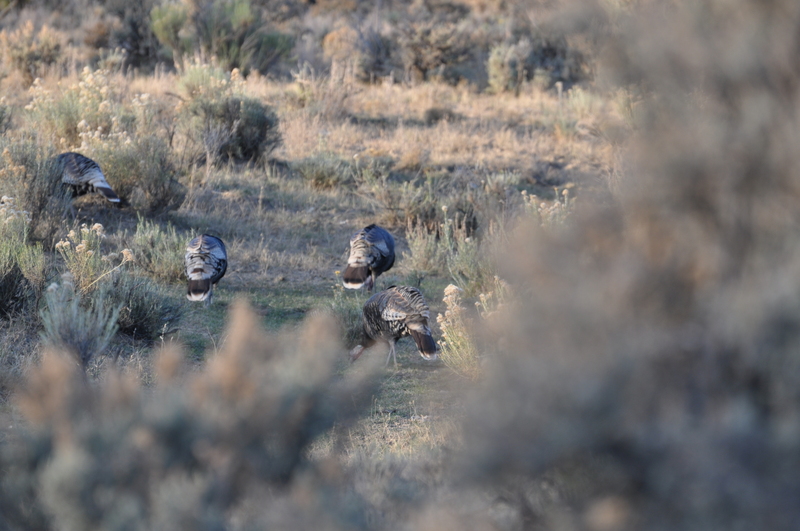 On the way back I spotted some turkey running through some tall grass. Once we made the rendezvous, we went out to the large sagebrush meadows near the main highway to do some glassing before dark. 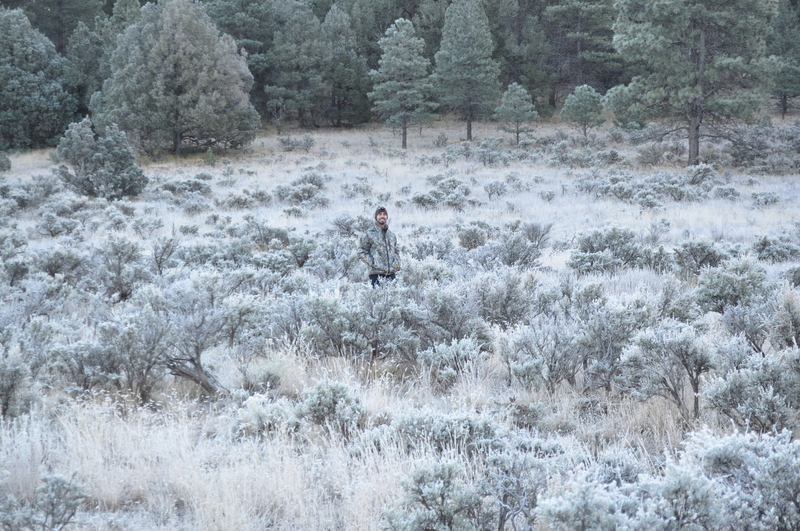 Justin immediately spotted some elk. As the night was starting to creep upon us we drove back to camp. About a mile before our turn we spotted three deer. Justin slowed the car to a stop so we could get a good look at ’em. 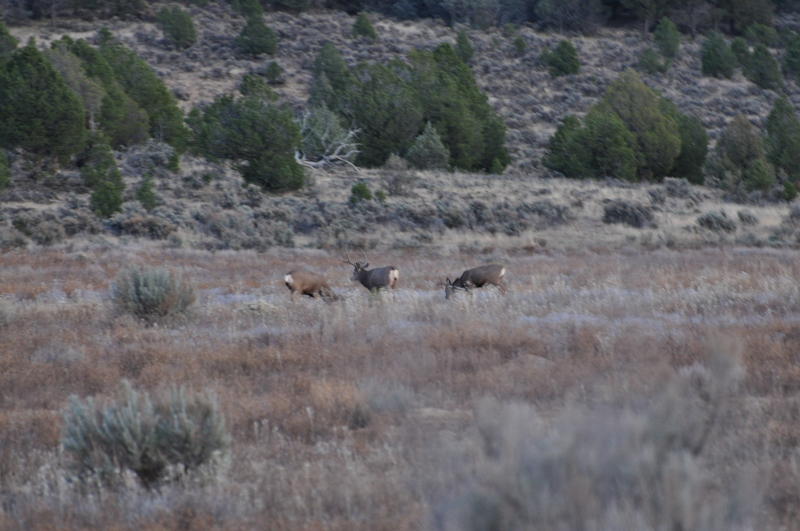 They were only about a 100 yards off of the road on some private land feeding in the dusk. One finally lifted it’s head to take a look at us. It was then that it finally hit me that this hunt was for real. As the deer lifted it’s head we couldn’t help but notice the massive antlers protruding far above the other two deer next to him. I finally had this sense of excitement and determination. Too bad it was the day before the hunt started and the three deer were hanging out on the small sliver of private land in the area. At least I knew the exact spot we would be going the next morning! The Mule Deer of Unit 5B. The buck on the left hand side is the giant 4×4 that we spotted. I guess I was a little too excited to wait patiently to get a good photograph of it. Sorry for it being blurry, very low light situation. On the morning of the first day of the hunt we woke up hours before daylight and headed to a spot near where we had seen the three bucks the night before. Brian was supposed to get there that morning and radio us when he was near. We found some high ground and started looking through the binoculars for deer. It wasn’t long before Justin spotted some elk on the far side of the valley. Shortly after Brian heard us over the radio and come to our location. After a few short hours without seeing any deer we decided to get in the truck and head to the area I had scouted the morning before, we will call it Lee’s Tank. We parked the cars about a half mile away to begin our slow and patient walk to the rocks where I had done my scouting. I heard Brian say “Get down I see some movement!” I hit the deck and images of massive bucks with racks the size of Christmas trees flew through my mind. We crawled our way up a small embankment and peered through our optics. I quickly saw two small white furry butts. It was almost a replay of the morning before, two small does going from the sagebrush to the cover of the forested area above. Even though the deer were not legal bucks, my heart was pounding. I actually thought to myself what is going to happen when I actually see something I can legally target?! 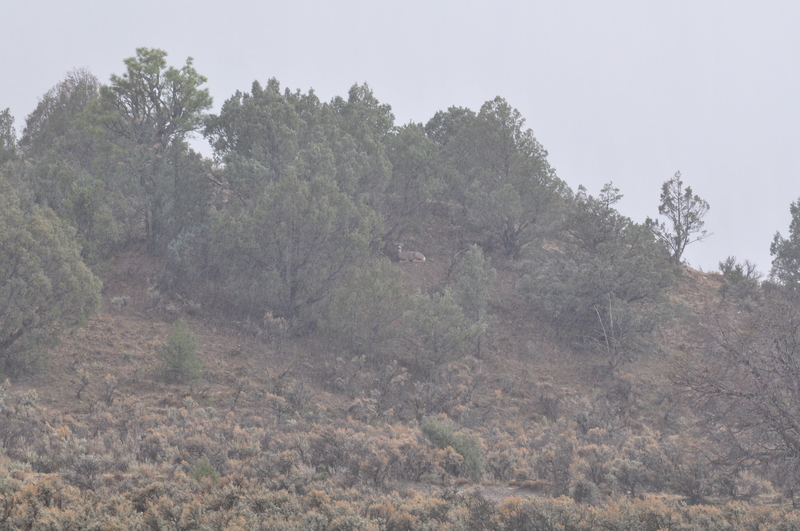 Without going into too much detail, those were the only deer we saw for the entire day. The next morning we started the same routine, drive to a spot, glass for some deer and repeat. The weather had changed and a storm was beginning to come through with colder temperatures, wind and rain. Again, I hear Brian say he sees movement! 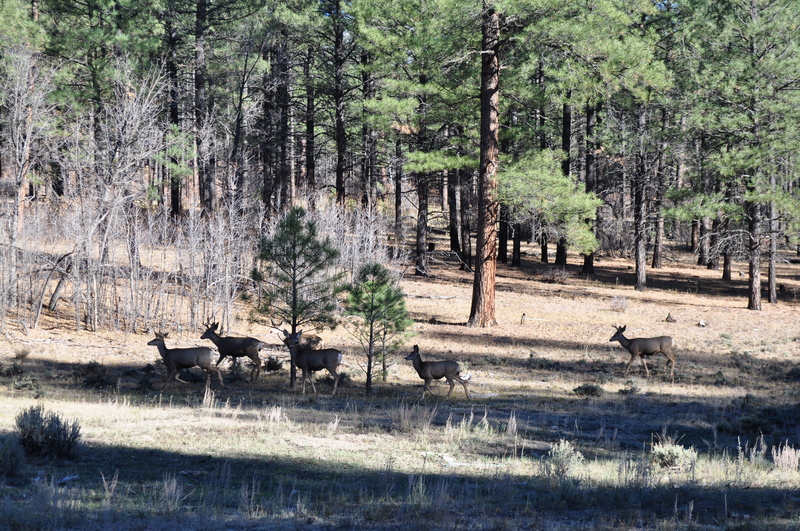 We quickly get low and start staring at the group of deer feeding on the edge of forest and private land. 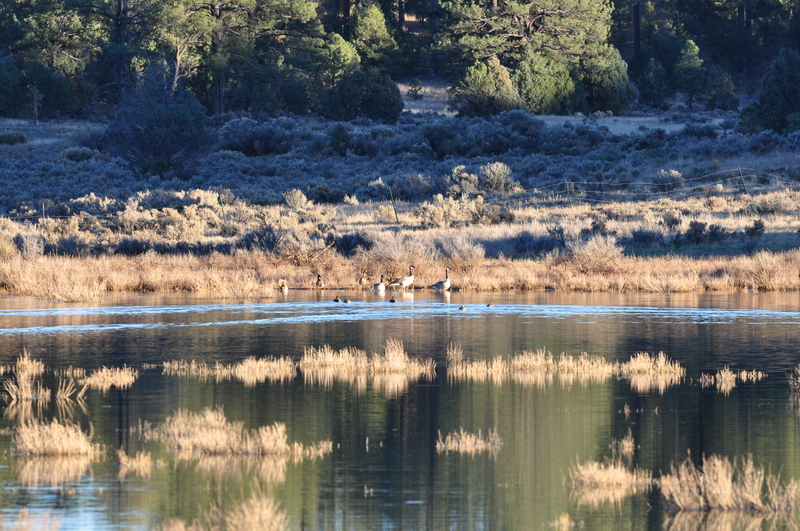 We spot a few does and then one deer lifts its head… A BUCK! I start making a stalk to get closer to the deer. It starts raining as I sneak from bush to tree. I was assuming the deer would move to the right alongside the trees. Turns out I was dead wrong and they go from the cover of the trees to the wide open sagebrush area, but most importantly away from me. I panicked, I started moving fast towards them and see a few of the does turn quickly and stare directly at me. I was found out. The next thing I knew the group was sprinting to the other side of the valley and into the trees never to be seen again. My chance had slipped right through my fingers. I made my way back to Brian and Justin. I was so close but so far away. We get back in the truck to slam some coffee and head to another area. I have to say, I felt pretty defeated. The rest of the day it rained and rained making the roads pretty hard to drive on. Brian headed home that night leaving Justin and I to fend for ourselves. We headed to a nearby town to get some gas and update family on the hunt. I got a nice picture message from my wife’s uncle of the whitetail he had taken the night before. Thanks for the pick me up, or the sorry about the one that got away! That night was spent listening to the rain spatter the top of the camper, we had a funny feeling the roads would be a little muddy the next day. When we got up it was cold, about 20 degrees colder than the previous few mornings. We got in the truck and high tailed it to some of the back roads to beat the mud. We definitely beat it in, but not out. As the day went on we hadn’t seen one deer, except a beautiful rock deer we made an awesome stalk on, so we went back to the original scouting location, Lee’s Tank. The rain had been good and washed away all of the old game tracks. We hiked around for a bit and came across a good amount of deer and elk sign. 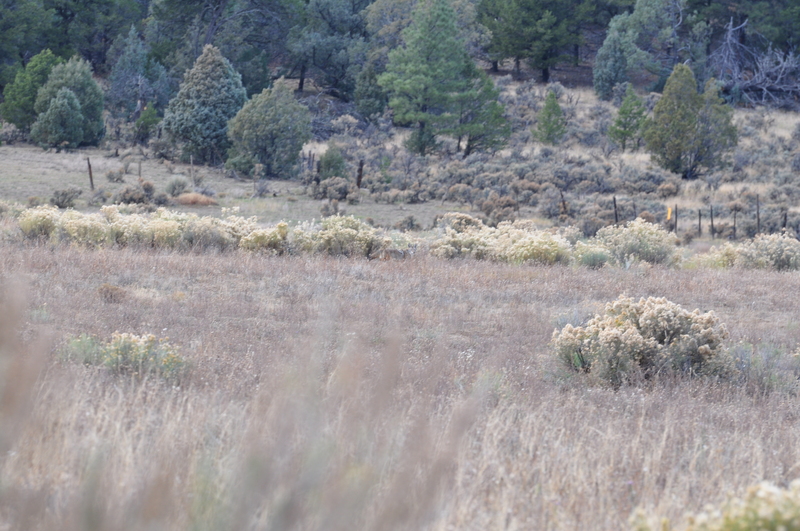 As the night got closer we started seeing elk everywhere! About 20 cow elk sprinting across the road followed by a very large bull elk across the meadow. People always joke about seeing deer when elk hunting and elk when deer hunting. I now know, without a doubt, its true. At the end of the day we counted about 30 elk, just no deer. With the hunt nearing its end there was a bit of nervousness at dinner that night. On the last day of the hunt, even though we hadn’t seen any deer, we decided to go back to the Lee’s Tank area, since we had seen so many tracks and fresh sign the night before. This was the coldest morning of the trip so far, a white frost was covering all of the sagebrush and grass in the valleys and meadows. We drove up the oil and gas maintained road on the frozen solid mud. As we crept along glassing every so often, we were enjoying the heat pouring out of the vents of Justin’s Tacoma. We would usually be out of the vehicle glassing and hiking around but since the temps were hovering around 20 degrees and my boots damp from the day before I was enjoying the protection from the cold. As we neared Lee’s Tank we saw some movement on the far side. Another stupid elk! 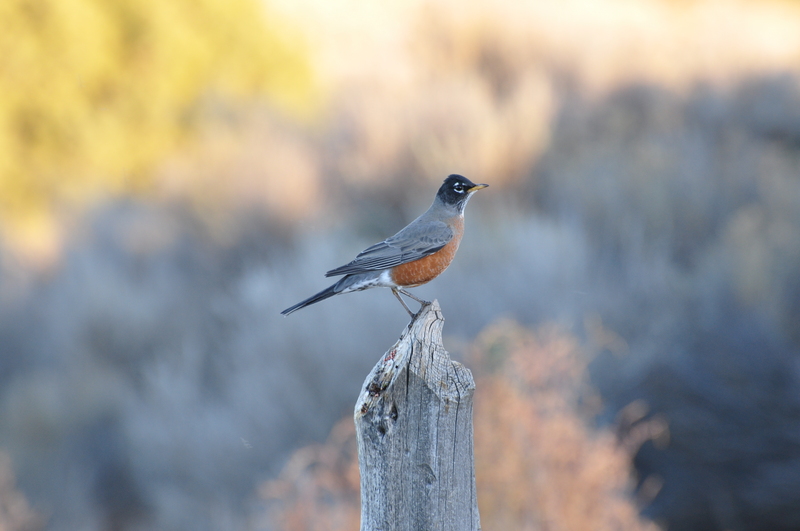 We kept on heading up the road when I noticed a large blueish gray back in the middle of some sagebrush. Before Justin could stop and get a good look at the deer, I was out of the vehicle with the door shut quickly moving off of the road to a legal position. I put my scope on the deer and waited for it to lift its head. 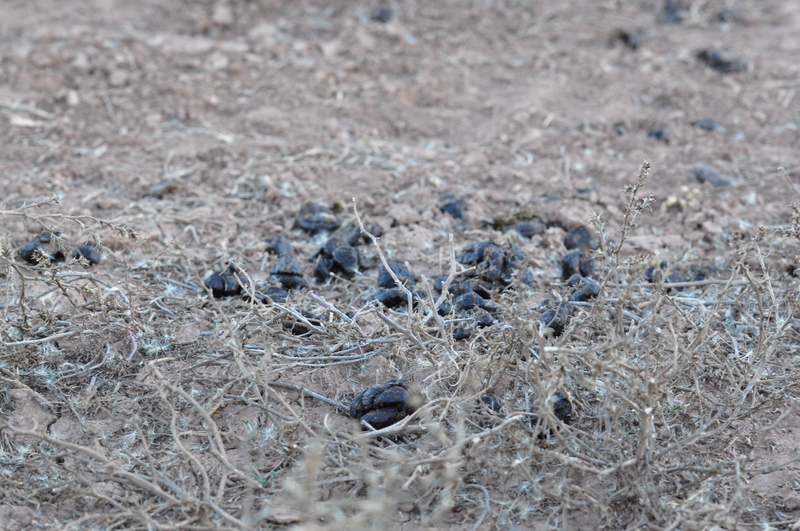 I kept saying to myself “please be a buck… please be a buck.” Finally it lifted its head and looked strangely at us. All I saw were antlers with a fork. At that moment, my heart rate must have been maxed out. In the excitement I figured the deer must have been about 300 yards away so I aimed a little high on the back expecting the bullet to drop about 6-8 inches. I squeezed the trigger and released the Nosler AccuBond round. The deer took a couple awkward steps and looked at us again. I thought I had surely hit him. I heard Justin’s muffled yell from behind me, “180 yards shoot again!” When I heard him yell the distance I instantly knew I shot right above the deer. Luckily, the deer was confused and didn’t high tail it out of there. I adjusted my aim for the correct distance and squeezed the trigger again. This time, the deer took two steps and dropped. The deer we harvested on my hunt. Very fortunate to have this opportunity. I am not sure what it was, but I have never felt pressure like I did on this hunt ever before. I think part of the pressure was the amount of money, time and effort I had put into it. I felt guilty for the purchases and time away. If I came home empty handed what was I going to say? Sure, its about the experience and I understand that. I use that excuse the majority of the time when I go fishing or climbing. Maybe its the low odds of success in a hunt or the lower odds of getting a tag to even go hunting. Maybe it was that my two buddies, who put in every year, have never drawn and in my first year I drew. I almost felt as nervous on that last morning as I did the morning I took my PhD. qualifying exams. Sometimes, especially in moments of doubt, your mind can lead you astray and send you into a self-inflicted panic. When I saw that deer take it’s last two steps, this giant weight was lifted off my shoulders and I felt so thankful for the entire experience. Besides harvesting a deer, the main goal was to treat the animal and hunting process with respect and understand that this is an opportunity that not everyone gets. In other words, don’t take this experience for granted and make the most of it. As we walked to the downed deer I had to kneel for a bit to calm down and take it all in. The temperature was still around 20 degrees and the sun was just barely sneaking over the ridge. If you asked me at the time, I would have said it was a balmy 70 degrees. We started to clean the deer, putting all of that YouTube.com watching to work. It went a lot smoother than I had thought it would. 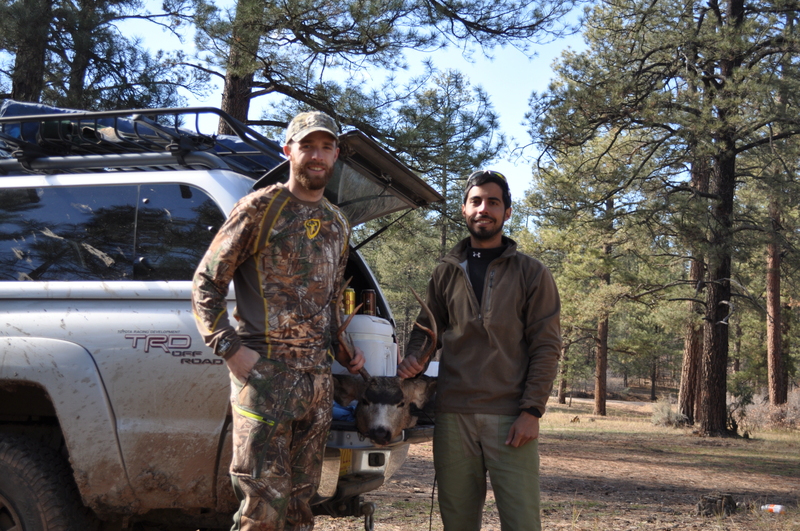 After loading the deer into the back of the truck, we headed to camp to finish the cleaning process and pack up. We enjoyed some victory beer and coffee and proceeded with skinning and quartering the deer. In the end, we saw three bucks during the hunt. The first I stalked, the second I watched as a hunter shot it right in front of us (Sorry I didn’t mention this before!) and the third was the buck I was fortunate enough to have a shot at. As we left camp to head home, on the forest road back to the main highway, we saw just as many bucks as we had seen the previous 4 days. After all of the doubt and struggle of finding deer, I laughed harder than I had all weekend when we saw that last group. Justin and myself with what was left of the deer after quartering and cleaning. I plan to make the most of this deer and, with the help of others, have already butchered the meat and tanned it’s hide. I am also in the process of cleaning and bleaching the skull to make a European mount to show my nieces and nephew. If anyone is curious, tanning a hide takes a ridiculous amount of work and time and making a European mount is one of the most gruesome tasks you can do. Let’s just say, I have a whole new respect for taxidermists. Going into this hunt without any experience was difficult. Luckily, I had two buddies who came to help out and I hope they can be a part of future hunts. The hunt itself was fun and exciting. The DIY taxidermy and butchering has been a lot of work, but tonight when my wife and I sat down for some venison tacos it was all worth it! Bird. Won’t even pretend I know what this is. Some very fresh elk sign. Taste… TASTE! We saw a lot of elk sign in the area including this rub. A turkey here is a turkey there! How many deer can you spot? We watched another hunter take this deer right before our eyes. His young son was bouncing up and down with excitement. Justin looking for the deer we had just taken. The group of deer we saw as we headed home. We saw one other buck on the way out. Congrats! It’s never too late to start! My boyfriend is almost 29 and this year is his first time ever big game hunting. Glad to see you enjoyed yourself! I myself bagged a mulie this year. It’s a great feeling!